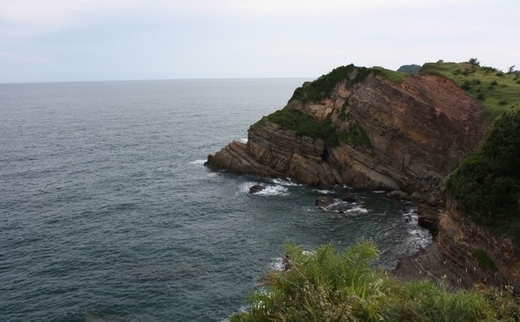 Tra Ban island in Bai Tu Long bay is also called Ban Sen island. Tra Ban is 45km from Halong City, 12km from the mainland. The area is 81.20 km2 at ebb tide and 68km2 at high tide. Tra Ban island has the highest Fairy tale peak is 485. Tra Ban’s radar station is the highest marine radar for North, located at an altitude of 484m. The highest point on the island over 480m with an average elevation of 20 meters. The hottest month ( July ) ² 28.6 ° C, the coldest month ( January ) ² 15.1 ° C. Island has a large valley creating natural water reservoirs in the west of the island should have fresh water all year round, enough for residents here. It is the largest island in the hundreds of islands in Bai Tu Long bay, Quan Lan island and not far from the port of Van Don and spend money in place and shield Van Don trading port: Port largest Vietnamese General Tran Dynasty. The time of the merchant ships in the North. Because the island has land, fresh water should be from the time he had inhabited. Plants on land have lim green hills, brooch, alternately filling and bamboo; mangrove areas of tiger, parrot. Terrestrial animals have civet, golden monkeys, squirrels, chamois, roe deer, wild boars, otters are hunted much ... but barely so. On the island there are iron ore discharge point (discovered 1966), limestone, tectit (gems). Now agriculture shrunk, partly people make their living at sea, the capital up friends aquaculture, partly as petty trade and services contracting part of plantation timber. Most people in society are recognized over the past dozen years, their lives have changed in the direction of better traffic no longer difficult with narrow dirt roads slippery and muddy on rainy days as before, but instead it is widely concrete road. Island has a primary school and junior high school was inaugurated two stories that have the appearance of a communal town inland. Paragraph small river flowing down from the mountains to the south - north side is a stone embankment, when the tide water, a small boat out into the landscape quite charming. Monsignor Shrine 3 of them on the foot of the mountain district. Ancient shrines rather large, year-round incense for anyone to go sea fishing or hunting are temples to burn incense and wish he had sheltered. The reason for the three shrines cousins scope Tran Dynasty, three pro- vice- minister he describes Tran Khanh Du Army General sudden impulse and Vietnam sank 500 ships carrying food Truong Van Tigers general supplies to troops Take Exit Festival on the river in Quan Lan Island. The victory, every soup he should declare a private island shrine. Ban Sen family also has ancient worshiping Tran Khanh Du, according to the elderly who live on the island and large family but due to a wrong conception of temples should have been demolished. However, no preliminary investigation temple. Radar stations located on the island’s highest peaks with altitude 485 meters above sea level. Many reporters in each group traveling across national regions, from high mountains to islands in the South Central and acknowledged: Radar station up the road is the most difficult and strenuous because gas Miss humid here year round, so the stones always smooth, slip the slipped immediately. Top station, a new brotherhood, their injuries are not lack of food, because the food that wounded soldiers living in moist year round. At nightfall blankets but also to bright light, it weighs a lot more than water vapor remains, including days of sunshine and dry never curved, wet clothes always so bright right out of his throat outdoor. If the half smokes cigarette paper is wet steam. Living in long wet well acquainted. Yet with all his weapons are always carefully preserved and always good 24/24h activities to ensure that all anomalies on the sacred waters of the country were not through his eyes.